My goal was to have a game where the hacking minigame mechanics and the roguelike mechanics were working together. The hacking minigame consumes and generates energy, which is the hunger clock for the roguelike portion. The hacking commands are used to win the hacking as well as determine what are prize afterward is (energy, information, upgrade/doors opening or pretty lights). In addition, the controls, the minigame and the physical keyboard are brought together to give a minor "furious typing to hack" interaction (in theory). I ran out of time; I was hoping to have more "multi-use mechanics" after adding monsters to the rogue-like side of the game. such as being damaged by the fried machines and having consoles which need destroyed in any fashion to progress. Sorry, didn't realize that the game page info wouldn't show up here too. Controls are ASDF and Arrow Keys. increase your max health (depending on console). Scan gives your current status and inside hacking will act as a multiplier for the next command in the command line. Multiple Scans can stack. If you finish a console off with Scan, you receive some information. Defend allows you to heal inside the hacking minigame. Had I had more time, I was intending to have mobile enemies where Defend could be used to brace, take cover and hide. If you finish a console off with Defend, you recharge to full charge/health outside of hacking minigame. Fry deals damage in the hacking minigame and turns the console into a sparking wreck. I was intending to have the sparking consoles damage pursuing robots who got too close. 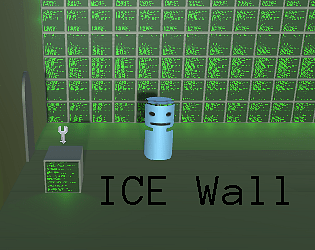 Overall, I feel conflicted about ICE Wall. It had a lot of promise but I think I dreamed a bit too big. It is playable now but I don't find it fun. Overall, this is my first GameJam with Unity and I like it. Need to be more familiar with it but it generally worked as fast or faster than myself. Esc + Esc (within 5 seconds) will exit from the game. Esc + A will refresh a new level. The levels are procedural and are not guaranteed to be solvable (although there should always enough keys to unlock every door, if you Access every key console). Tips: When you send in a Command Line of four commands, the miniscreen on top will tell you if each command worked or was blocked, in order. Each console may block up to two commands on each 'port'. Even if the last command was blocked, it still counts for "Last Hit" purposes.